You'll love this if you’re a cruciverbalist (a crossword puzzle addict), a logolept (a word lover), love to increase your vocabulary or, like to have fun with word games! 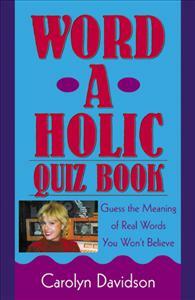 Welcome to the Word-a-holic Quiz Book. I’ve collected some wild and crazy English words and their often-surprising definitions. In the pages you’re holding in your hands—you’ll try to guess the meaning of real words you won’t believe. Did you know the average English-speaking person uses the same 400 words 80 percent of the time? That means the over 400,000 additional words in most Standard English dictionaries are left back collecting dust!